Not only is keeping a sharp edge on your knife’s blade important for the overall function of the knife, but it’s also important for your own protection as well. Applying force on a dull blade can lead to some serious injuries, and in a survival situation especially, an injury is the last thing that you want. Even if you manage to successfully treat it, an infection could still set in and that’s a game changer in any survival situation. 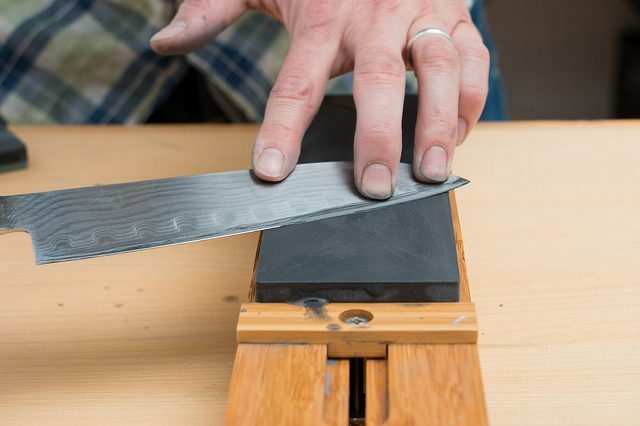 We will now teach you how to sharpen your knife with only a whetstone. A sharpening stone of some kind belongs in any survival kit so that you can pull it out and sharpen your knife whenever the need arises. Follow these steps to get it right. You can never start sharpening a knife without first choosing the angle at which you will sharpen it. Generally speaking, you’ll want to sharpen your knife from the same angle that you’ve sharpened it already. Sharpening it at a new angle will be a far more time-consuming process. If this is your first time sharpening your knife and don’t know the angle that you need to sharpen it at, you should read the directions that come with the knife or contact the manufacturer to ask what angle is best for sharpening your knife. If this your first time sharpening your knife and you don’t have the means to contact a manufacturer because you’re in a survival situation, then a good rule of thumb is to sharpen it anywhere from 10 to 30 degrees on either side. The shallower the angle, the sharper the knife will be but the lesser amount of time it will hold an edge, while an angle that is steeper won’t be as sharp but will also be more durable. An angle of 20 degrees would be a good compromise between a shallow and a steeper angle. One way that you can test whether the knife is being sharpened at your desired angle is to mark the very tips of your blade on both sides, with either a sharpie or a marker, and then see if it is removed while being sharpened. If it is, then it means that the knife is being sharpened properly. Once you’ve selected the angle at which you will sharpen your blade, it’s time to lubricate the whetstone. 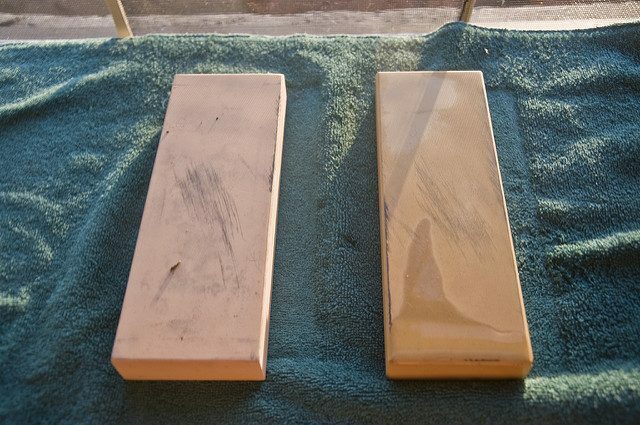 The best way to lubricate the whetstone is by using a small dab of mineral oil. 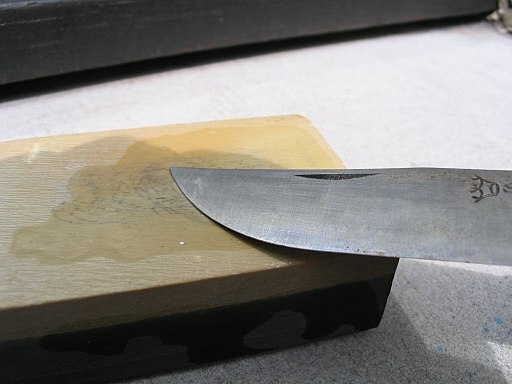 The purpose of lubricating the whetstone is so that it is easier to sharpen the knife. 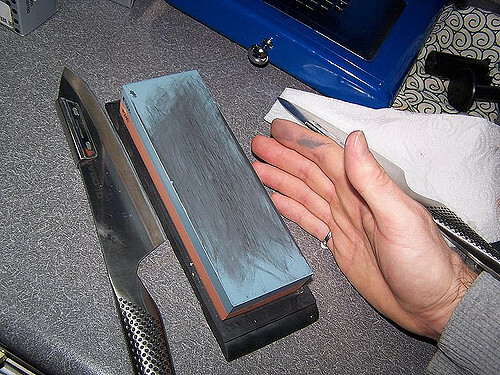 Your whetstone should have come with directions from the manufacturer as to the best kind of oil to use and how much of it to apply. 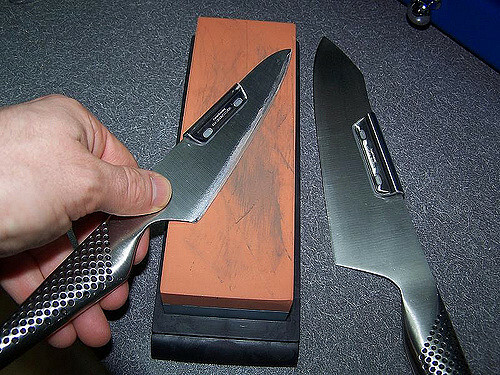 If you’re in a survival situation and don’t have any mineral oil with you, it’s perfectly possible to sharpen your knife using a whetstone that has not been lubricated. However, the actual sharpening process will likely be more gritty as the blade will not pass over the whetstone as easily. 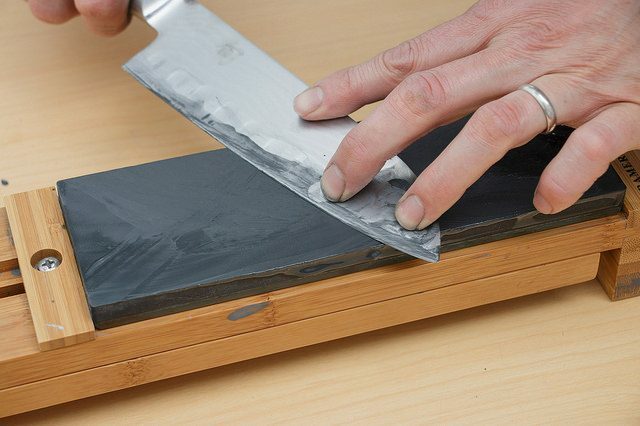 Right before sharpening your knife, you will want to identify the grit that is on your whetstone. Most whetstones will have a different kind of grit on either side. The grit on one side will be quite rough, which is designed to grind the knife, while the grit on the other side will be finer and designed to hone the knife. Grinding comes first, so always begin sharpening your knife on the rough side. Drag the knife across the whetstone, on the rough grit side, and in the opposing direction of where you would otherwise move the knife to slice the layer of stone. This action will increase the life of the whetstone. You will want to continue this process of grinding the knife until the grind has gone around halfway through your steel. Next, simply repeat this process with the other side of the knife. Again, use the rough grit side of the whetstone. Once this process is complete, you will begin to see a new edge forming on the knife. Even if you don’t see this edge, you will physically feel it by running your thumb or finger along the edge of the knife. However, the sharpening process is not over yet. We still have to hone the edge of the blade. The next step is to hone the blade, which will require you to flip the whetstone over to use the finer grit side. While an edge has already been created on your knife by the grinding process, the honing process will smooth this edge and make the blade sharper. 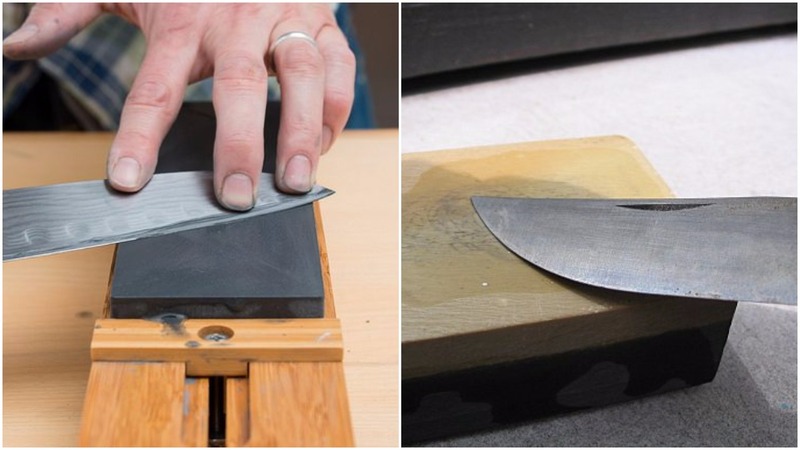 Begin sharpening your knife on the finer grit of the stone, just as you did with the rough side, and then flip it over and complete this process again with the other side of the blade. It’s imperative that both sides of the blade are honed, or else the edge will not be completely smoothened. When honing the knife, you will want to run it along the fine grit side in one, long stroke at a time rather than a rapid series of small strokes. With the steps that you have learned in this article, you can easily sharpen your knife to your desired sharpness level. Remember that a knife with a dull blade not only won’t do you much good, but it also can be dangerous and inflict an open wound on you if it slips. A sharpened knife will complete any task and reduce the chances of an injury happening. Always keep a whetstone as part of your survival kit so that you can sharpen your knife when lost out in the wilderness. Have any comments, please drop us a message on our Outdoor Revival Facebook page. If you have a good story to tell or blog, let us know about it on our FB page. We’re also happy for article or review submissions; we’d love to hear from you.